KOKOMO, Ind. – On a cold, drizzly late October evening, the IU Kokomo women’s volleyball team not only had to battle the weather, but an even colder Indiana University Northwest squad that entered with an 11 match losing streak. Sometimes, those are the hardest to win. But after a sluggish start, the Cougars showed why they are a ranked in several national categories, downing the RedHawks in straight sets – 25-12, 25-12, 25-16. IU Kokomo jumped on the scoreboard with the first point off an IU Northwest error, but the Cougars returned the favor and gave the RedHawks (2-31) a 2-1 lead on two errors of their own. After a pair of ties and a lead change, the Cougars regained the lead 5-4 on service ace from Kaleigh Ensley (Fort Wayne, Ind./Snider) and increased its lead to 9-5 on a kill from Shelby Spall (Kokomo, Ind./Western). The RedHawks closed to within three at 10-7, only to see Micayla Speidel (Columbus, Ind./East) and Cortney Hanson (Logansport, Ind./Pioneer) each score on two blocks and two kills, increasing the lead to 15-7 and the easy win. The second set was much like the first, with the two IU programs battling to a 9-9 draw. An ace from Hanson followed by two consecutive blocks and a kill from Keeana Walton (Peru, Ind./Maconaquah) gave the Cougars a 14-9 lead. The Hawks cut the lead to 14-10, but Ensley served up six straight service points, including a pair of aces, to put the set out of hand. The Cougars closed the match with a kill from Walton, two from Kaley Harness (LaFontaine, Ind./Southwood) and a set-winner from Spall. The Cougars jumped to a quick 10-4 and 11-5 lead in the third set, but according to Hayes, they lost focus on the task at hand. IUNW scored five straight points – all on Kokomo miscues – to cut the lead to 11-10. Clutching to a 13-11 lead, Hayes called a timeout after another Kokomo error. But whatever she said in the huddle refocused the Cougars. Megan Riley (New Palestine, Ind./New Palestine) started a rally with a pair of kills, and when the third set dust settled, IUK scored 12 of the next 16 points to close the match in straight sets. Speidel led the Cougars attack with eight kills and three blocks. Walton and Harness added six kills each and Spall had seven kills and three blocks. 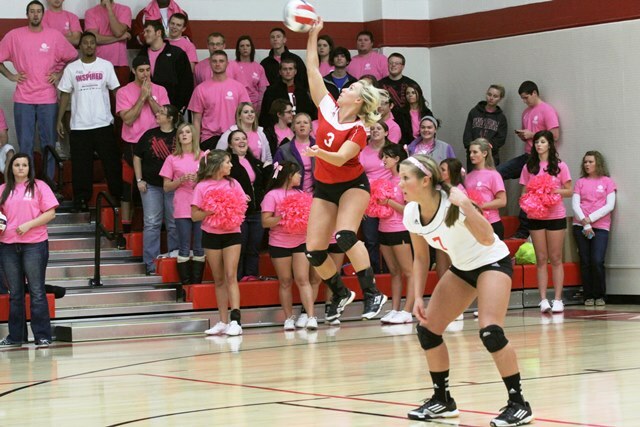 Hanson had 22 assists and 10 digs while Lael Burrus (Denver, Ind./North Miami) led IUK with 11 digs. Entering the match, Speidel was second in the NAIA with 463 kills and the Cougars were third with 245 service aces. Hanson had 972 assists and Burrus had 491 digs – both players were ranked 20th in the nation. The Cougars (27-8, 8-2 in the Kentucky Intercollegiate Athletic Conference) return to action on Halloween night with a 6 p.m. match against KIAC foe Asbury College (27-7, 7-1) at Cougar Gym. Asbury is currently second in the KIAC and the Cougars are third. IU East (23-10) leads the conference with a record of 9-1. The final home match of the season is Nov. 1 against Marian College at 7 p.m.